The Real Driving Emissions (RDE) test measures pollutants, such as NOx, emitted by vehicles in real-world driving conditions. It will work alongside the new WLTP fuel economy test to ensure that Euro6 regulations are met. But the RDE can test for things that the WLTP can't - like weather conditions, a vehicle's payload and different driving styles. 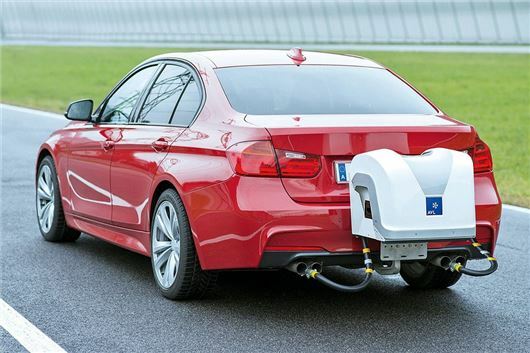 RDE results will be used in conjunction with the laboratory-controlled WLTP tests to calculate more accurate fuel consumption and emissions figures for each car. Essentially, the RDE is designed to ensure cars deliver low emissions in the real world, rather than just in a labratory setting. Under RDE, a car is driven on public roads and over a wide range of different conditions. These include high and low altitude, year-round temperatures, up and down hills, with extra weight and over a variety of speeds to simulate urban, rural and motorway driving. From April 2018, the first year VED rate for diesel cars will go up by one band, unless the vehicle meets RDE2 standards. For the average diesel on sale this means an increase of around £40 - pushing it up from £165 to £205. The changes will not affect vans. With RDE not set to be mandatory until 2021, it means new diesel cars sold from April 2018 will all have to pay a first year tax of one band higher. However, after that diesels will pay the same annual VED - currently £140 a year - as petrols. Equipment installed on the vehicle - catchily called Portable Emission Measuring Systems (PEMS) - collects data to ensure that pollutant limits aren't exceeded. However, PEMS aren't as accurate as a laboratory system because the results are affected by various factors. In practice, car manufacturers must set their emissions objectives well below the legal limit to be certain of complying. The strictest RDE test (known as step 2 or RDE2) won't be mandatory on all new cars in Europe until 2021, although there's nothing to stop a manufacturer testing its cars before that date of course. It has technically applied to all new cars being launched since 1 September 2017, then all cars from September 2019. However, this is for what is known as step 1. Why the two steps? Well RDE tests are subject to a conformity factor - or wiggle room - allowing a margin of error to account for the fact that the present performance of PEMS equipment isn't consistent. The margin of error in step 1 allows cars to emit 2.1 times the limit. But in step 2 this is reduced to 1.5 times the limit. The majority of manufacturers haven't tested their cars through RDE2 yet. And, with the Government raking in an estimated £125 million in fees for cars that exceed RDE2 emissions standards - we think it's safe to assume most cars won't pass. So who is going to run the tests? Manufacturers? In that case how long before they are caught fiddling the figures again? I don't trust any of it! Also, has anybody given a single thought to the huge numbers of jobs involved in the several plants which still manufacture diesel engines as the demonising of them continues?. As one example, Ford's Dagenham plant produces over 700,000 diesel engines a year and keeps people in employment, if demand for diesel engines continues to decline, and these plants close or reduce their workforce, where will they find alternative employment?, I don't see many new plants being built in the UK which manufacture Electric Car batteries or Electric Car motors or Electronic Drive Controls, so we aren't even replacing the jobs which are under threat, from the growth of the alternative cars which we are driving people towards. I'm about to order a company car so this has a big impact on me, is there a list anywhere that shows which vehicles already have an RDE type test? I'm really struggling to find this. I'm a fan of diesels My current car is 10 years old, done 160k miles and time to change but I can't justify doing that now. - Local councils and cities will increasingly surcharge me for either living there or trying to get there in a diesel. - And i don't believe that the road tax i pay wont be targeted as well, even for an existing car. There is just too much risk in choosing diesel now.